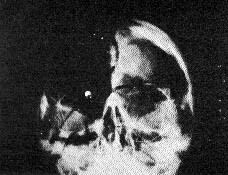 Above are the two published X-rays of John F. Kennedy's skull, the left image showing a frontal view and the right image showing a lateral view. 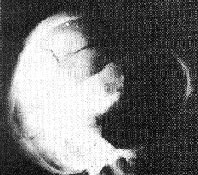 The Clark Panel, as did the HSCA, concluded that they show the upper right portion of the skull missing--most of the right parietal bone--with the back of the head intact except for several large fractures. One would be hard pressed to match these conclusions to those two images. Indeed, they don't even seem to show the same damage between the two views. The back of the head and forehead look intact in the lateral view, yet one or the other appears blown out in the frontal view. The X-ray images only appear that way. Several factors contribute to a misleading appearance of the X-rays. This document will attempt to make sense of these images, show that they are compatible with each other, and demonstrate that they support the HSCA's conclusions. The Assassination Science images in these web pages are used with the permission of Jim Fetzer.